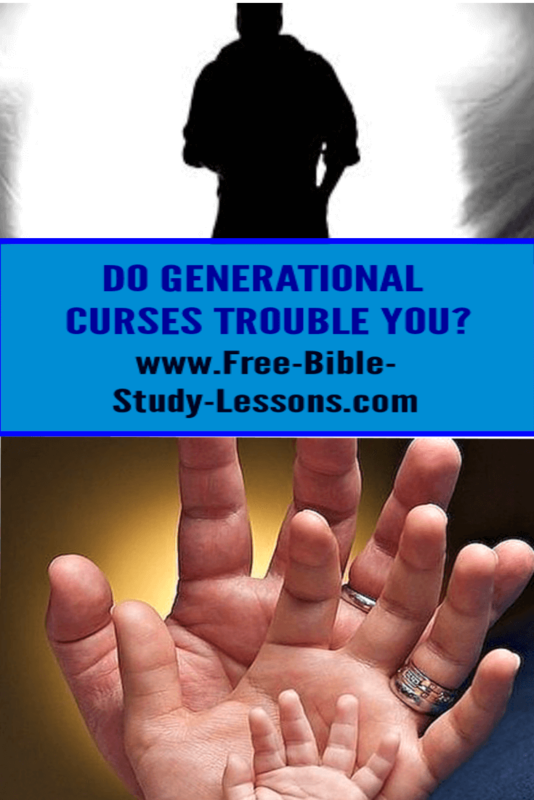 There are lot of ideas and teachings on the subject of generation curses. Many of these ideas come from outside of Scripture, but there are some aspects that are valid. We are going to look at what the Bible says about these so-called generational curses. Are they something you need to be concerned about? The first thing we must do is define what is meant by generation curses. To begin with, a curse is God bringing judgment [the ultimate being separation from God] on someone or something. We see the first curses right after the Fall of Adam and Eve. God cursed the ground and because of its separation from God it would be barren instead of bursting with life. It would require hard work to become fruitful again [Gen. 3:17-19]. God also cursed Satan in the form of the serpent. Satan is forever separated from the blessing of God and is non-redeemable [Gen. 3:14]. A curse can also be when someone is asking for God’s judgment [or simply trying to place God’s judgment] on someone or something. The effective curse separates a person, thing or situation from the life and blessing of God thereby bringing pain, destruction and death. God’s curses are always effective and man’s curses are effective only when they are in agreement with God’s curse [Num 23:8, Pr. 26:2]. A generation, in Scripture, is considered to be 40 years. A generation curse then is a judgment of God on sin that is passed from father to son to grandson, etc. Where Does The Idea Of Generation Curses Come From? Generation Curses From These Verses? The first thing, that I find ironic, is that the Bible never uses the word “curse” in relation to these punishments. Because it appears to be punishment over generations we use the word “curse” and call it a generational curse when it would be better to describe it as “accumulative punishment/consequences” rather than the horror of the curse bringing destruction, death and separation from Life Himself. God is perfect justice. He does not allow criminal law to punish one person for someone else’s crime [contrary to many ancient law codes]. God is certainly not going to do it Himself. Note: If you study out both the Leviticus and Lamentations passages you will discover that they were suffering from the “ancestor’s sins” only because of their stubborn refusal to repent and abandon them - of which God gave them many opportunities. God promised Abraham the land of Israel, but he could not have it yet. God, in mercy, was still allowing the Amorites time to repent and abandon the sins of their fathers. In His foreknowledge, God knew they were not going to repent and in the fourth generation the accumulative judgment would fall. Again from the life of Abraham, Abraham twice told a half lie to save his life. He said his wife, Sarah, was his sister. She was, in fact, his half-sister, but he deliberately failed to mention that she was also His wife [Gen. 12, 20]. His son Isaac saw that his father escaped with few consequences so he did the same thing [Gen. 26]. Only in Isaac’s case it was a complete lie - Rebekah was a cousin not a half sister. The consequences increased as lies and deception became common in his family. Isaac’s son Jacob then deliberately lied to his father to steal from his brother…and had to run for his life from his brother’s wrath and spend years being deceived and mistreated by his uncle. This first sin grew through the generations along with the consequences, but each generation voluntarily embraced the sin for themselves. Read through the kings of Judah. You will discover when the king was a good king - following in the ways of his father David - he was blessed by God regardless of the sinful nature of his physical father or mother. When he was a bad king - following in the ways of Ahab - he reaped the accumulative justice of God regardless of how righteous his physical father had been. Third, as mentioned above, this applies to those who hate God and continue in the sins of their parents. This means when you accepted Jesus as your Lord and Saviour those ties were forever ended at the Cross. You are no longer under the accumulative consequences of your ancestors! Fourth, the teaching on generational curses usually points to some sort of demonic activity in the family and in carrying the sin down the generations. Read the above verses in context - along with any others you may find. Do you see any mention or indication of direct demonic involvement? Fifth, keep reading! What does it say? Follow me here. You [if you have accepted Jesus as Lord and Saviour] are in Christ. You are part of “those who love me and keep my commandments.” When you accepted Jesus, you died to your past. You received an entirely new genealogy. Through Christ Jesus you are related to every righteous man, woman and child who has ever lived. What does God say about blessings? They pass on to, at least, a thousand generations or about 40,000 years! [Earth has only been around about 6,000 years so far.] Every blessing God has ever poured out has an accumulative effect coming down to you and passing through you to the generations to come. Not only are you receiving the favour of God from past righteous generations, but also you are passing it on to future generations. Do I Need To Be Concerned About Generational Curses? No in that, as we said previously, you are in Christ. Any evil from your past is cut off. It is gone. It is dead. You are a new creation in Christ. God smiles on you as His child. Any generational sins or accumulative judgments were paid in full by Jesus Christ on the Cross. You are FREE. You can enjoy God’s presence, love and blessing. Yes in that we both know that our experience does not fully match the Truth because we have to grow. As we grow in our knowledge and relationship with Jesus Christ our experience comes more in line with the Truth. It takes time and it is a process that Jesus walks with us through. Sins of the father no longer have a hold on us unless we truly still believe that they do. In which case, we will live as if they still bind us. In other words, we will live a lie from Satan and act accordingly. In all honesty, there are lies in all of our lives that have not yet been exposed and dwelt with. That is part of the Christian life and maturity…learning the Truth in every area of our lives and choosing to walk in it. Keep a heart soft and open to the Holy Spirit and He will guide you step-by-step through the process. For stubborn sins [whether they were in your physical ancestors or not] you may need Godly counselling and help from trusted Christian friends, your pastor or even a professional counsellor. This is one reason God put us in His Church, His family, so we could help one another walk in victory and reach our potential in Christ. The sins of the fathers can also be clue to possible weaknesses that we may have. Being aware of what has tripped up our physical ancestors can help us be on our guard as we may have a similar weakness. For example, if alcoholism has tended to run in your family, then total abstinence may be a wise plan to avoid being ensnared. We all have weaknesses and being aware [not afraid] of them can help us avoid unnecessary temptation and failure. If you have a sin that you simply cannot seem to defeat, then you may have something in your past that needs to be brought to the Light and dwelt with in Christ or if the Holy Spirit brings something to your mind, then deal with it right away and put it behind you. But don’t go rooting around in your past or family tree trying to find things! Keep your eyes on Jesus and walk steadily toward Him.